Also, an update on the St Colin and the Dragon books. They have arrived now so if you’ve pre-ordered a copy it will be with you soon. If not you can get one in the shop! I wouldn’t trust the Rubber Bandit. He looks way to sneaky. And Clopsy! Don’t forget Clopsy as part of the characters! Is baby bandaid in any way related to dr bandaid? Maybe Dr. Bandaid finally gets a long-term relationship! A relation to Pauline sat on Robin Wood’s head? Happy 700th!!! Keep up the ace work! You should make a “Cast of Characters” page now! oooh how fun! Baby bandaid is foreboding something. I am excited for Rubber Bandits Heist Adventures. I would like to see Glen Check, who looks like that slightly boozy guy from around the corner who always wants to borrow your lawn tools, try to befriend Cardboard Carl. Maybe Glen has a daughter he’d like Colin to meet! This is my first time here and I love the punny names! And the art!! Extremely well-executed! now…699 more to go through! I can already tell the Rubber Bandit is going to be a LOT of fun! 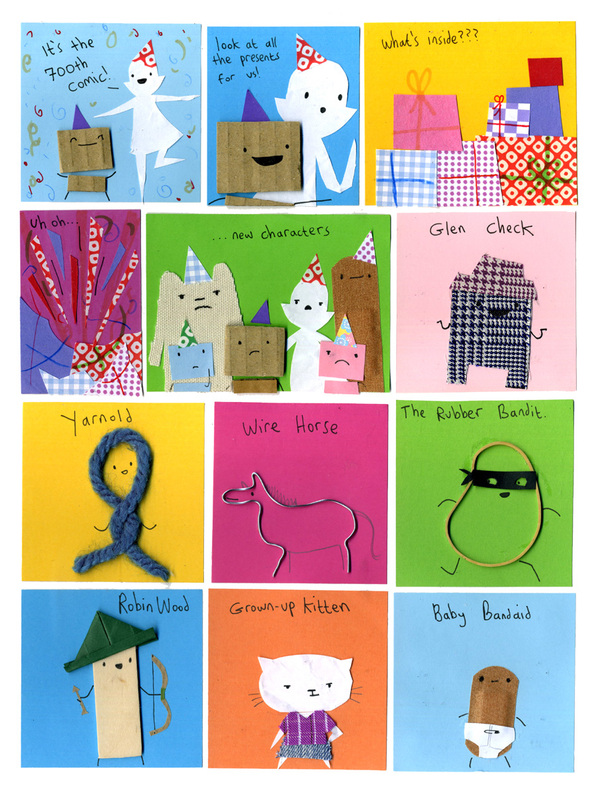 I’m also looking forward to Yarnold, Wire Horse, & Baby Bandaid comics. Is Glen Check based on a certain other Glenn -eck we know? No, glen-check is just a type of pattern for fabric, like Prince-of-Wales-Check or hounds-tooth. I can’t wait for the Robin Wood comics. Who did it? Rubber bandit. Sorry, I should be getting some sleep.